Reserve BC Provincial Park Campsites...carefully! British Columbia Provincial Park Campsites can be reserved but a caution for online reservations can be taken from my experience. 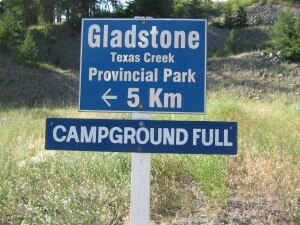 When reserving a Provincial Park Campsite one can reserve a site up to 90 days in advance. In May, my family and I along with 3 other families decided on reserving a few sites at Texas Creek Provincial Park for July 2nd through July 4th. I registered first and then called the other families and told them to register right away as therre were only 3 sites left. So they did, in the registration process, they (luckily for us) a section pops up that allows you to write any special requests. In that section each of our friends wrote that they wanted to have a site close to the Kessler’s. After completing my reservation and paying with a credit card, I checked back on the Discover Camping website where the reservations are made and each time I logged in a message said “Pending”. To me pending meant that someone was looking for a site and just needed to confirm via email that I was good to go. After a few more days, I checked back again and found that my reservation did not exist and my credit card was not charged! I called the toll free number, they were informative but I don’t think they lived in Canada and did not get any satisfaction so I emailed. Texas Creek Provincial Park lies on the shores of Christina Lake in Gladsonte Provincial Park. You will have to talk to the campground operator in regards of you joining your friends site. BC Parks party size is 8 people on 1 site 4 ad 16 and older and 4 children 15 and younger. It is up to the Operators discrestion whether or not you can stay on one site with your friends. They may tell you yes, you can stay on your friends sites and charge you for extra people or you may be told to do a first come first serve site if one is available for you. It was even more surprising when the sign on Hgwy 3 said the campground had no vacancy.